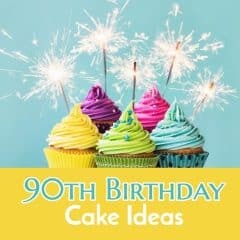 90th Birthday Ideas - 100+ Fun & Unique Ways to Celebrate Turning 90! What’s a birthday without a cake? Get inspired with these festive 90th birthday cake ideas! 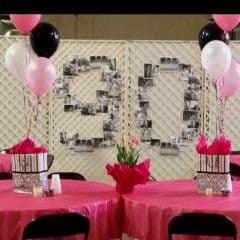 Plan a memorable 90th birthday party with these fabulous ideas! 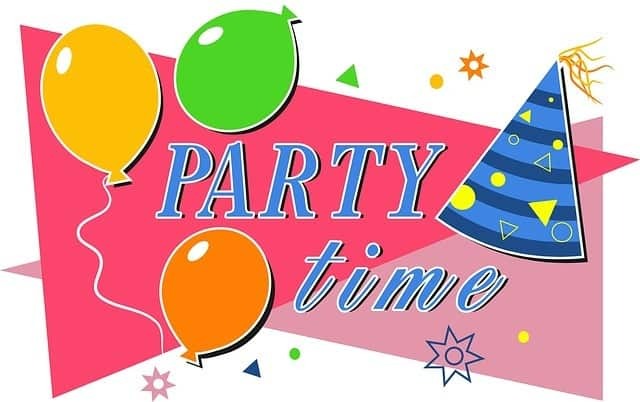 If the birthday man or woman is up for it (some 90 year olds are not really that energetic any more), then consider throwing a 90th birthday party. It can be as small as just immediate family members, or it can be an elaborate celebration. Definitely talk with the birthday celebrant about what he or she would prefer. That way they’ll be able to enjoy planning the party, and will have the pleasure of looking forward to the event. Think twice before planning a surprise party for someone of this age. A 90th birthday is a time for reflection upon the amazing events of a lifetime. Help them out by making a scrapbook or photo album filled with some of the highlights of their life. Take advantage of email and Facebook, or other social media sites, to request pictures from spread-out friends and family. The celebrant will enjoy seeing long-lost faces and pictures! What has he or she always dreamed of doing, but not quiet gotten around to? This is a great time to fulfill as many of those bucket list items as possible. 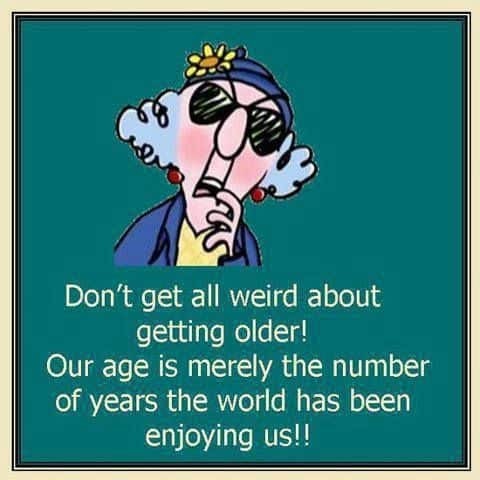 By this age, there are probably many places that were important to the birthday man or woman at some point in their life. If possible, take them back to some of the meaningful spots – the house they grew up in, their old schools, places of employment. Most seniors truly enjoy a trip down memory lane! And you’ll enjoy hearing the stories of what their life was like all those years ago. For a special treat, consider renting a limo or large van and taking family members with you on this memory tour. Who doesn’t love to get birthday cards in the mail? Make their 90th extra-special by having as many family members and friends send a birthday card to them. Ideally, it would be wonderful to have 90 cards. A card campaign takes a bit of organizing, but the pleasure it will bring the celebrant is well worth it. Read details about how to organize a card campaign here. Put your tax dollars to work, and order a birthday card from The White House (read the details here). It’s free (well, you’ve already paid for it via taxes), and is sure to thrill the senior. It takes at least 6 weeks notice, but the more notice you can give, the better. This is another great use for a lifetime’s worth of photos! You can transfer pictures to fabric squares and sew a quilt full of memories and love. A fun idea is to send fabric blocks to family and loved ones and ask them to write a message on the fabric, then sew those blocks into the quilt as well. Find directions on how to sew a memory quilt here. Surround your favorite senior with flowers that feature the pictures of their loved ones. It’s a cheerful decoration that is sure to brighten any room. And they’ll love having so many pictures of their favorite people! 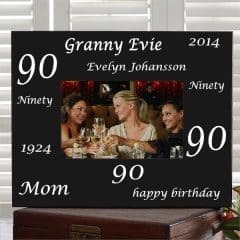 This is a wonderful 90th birthday idea that makes the excitement and enjoyment of turning 90 last long after the actual birth day! Write 90 little notes of appreciation or memories on decorative paper, and then put them in a pretty jar or vase. You can do all the notes yourself, or ask other loved ones to write notes. Then, each day for the next 90 days, your senior can look forward to opening a note. Playing games together is a wonderful way to enjoy being with your favorite senior - and it can be fun if the kids are involved also. Consider games from their childhood, such as checkers, dominos, or card games. Games that the whole family might enjoy would be Trivial Pursuit, bingo or corn hole. An event like this certainly deserves a toast or two! Why not pop open a special bottle of champagne and celebrate turning 90 in style. Dancing on the tables is strictly optional. Listening to music is a wonderful way to recall favorite memories. Download some of the most popular songs from his or her childhood and teenage years to listen to together. Order a few of their favorite childhood movies to watch together. Chances are, you haven't seen movies from those long ago days - you'll enjoy seeing how much technology has changed! Plant a windowsill garden full of herbs, plants or other flowers. He or she will then be able to enjoy the glimpse of nature long after his or her 90th birthday has changed. If you have small children in the family, have them decorate flowerpots with their handprints and names. 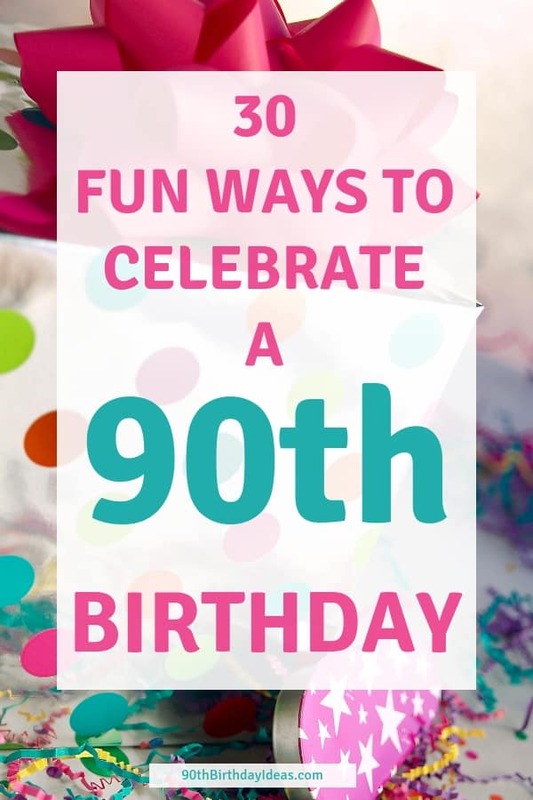 It's a great way to involve kids in the 90th birthday celebration! This is another fun activity that both seniors and kids can enjoy together. Decorate shirts with fabric paints - check Pinterest for easy ideas. Surprise them when they wake up in the morning with yard decorations - the bigger, the better! I'm sure you've seen all those huge "Happy Birthday" signs that are so popular right now. Birthday candy grams are fun to receive, easy to make, and inexpensive to put together - a wonderful way to celebrate this big birthday! If the whole family is getting together to celebrate, take time during your day to have a photography session. If possible, get a professional to take the pictures - these are the types of pictures that will become family heirlooms. You don't have to be too serious, though - bring along a few photo props to capture those goofy moments! Bring all the family together for a vacation that they will always remember - and treasure! Look for something that appeals to all the different generations, such as a cruise or a resort vacation. I'm sure your senior has fond memories of sipping milkshakes at the drug store soda fountain! If you can find one still in existence take him or her there. Otherwise, mix up your own milkshake at home for a special birthday treat. Checking out vintage cars would be a great 90th birthday idea for Dad, Grandpa or another car buff. Check your local newspaper or Twitter feed to find an antique car show near you. If the weather is good, get them outside for an alfresco dining experience. Choose a park near a playground so the kids can enjoy that. Most seniors would enjoy watching the children play. Because everyone should sing badly in public at least once in their life. Cards, free drinks, buffet...and the chance to win a big jackpot on their birthday. Remember, this is the generation that went through the Great Depression, so money is usually pretty important to them! Instead of one large gift, why not give 90 small gifts? Small pieces of candy, stamps, flowers, beads are just a few ideas. The grandkids and great-grandkids will probably enjoy thinking (and counting out) the 90 gifts. If you're looking for a special way to celebrate Mom or Grandma's 90th birthday, take them to an elegant tea. She'll enjoy dressing up and being pampered and fussed over at high tea. Scan all those old pictures onto a disc to play as a movie. Serve popcorn and candy just like at a real movie theater! Who doesn't like balloons on their birthday? Fill their house or room with 90 balloons in their favorite color. Attach small pictures from all during their life to the dangling ends for an impressive look. See the details here. One of the most creative ways to celebrate a 90th birthday is to plan 90 days of celebrations. This requires a bit of coordinating with family and friends. Assign each of them one of the 90 days before the actual birthday to send a card, drop off a gift or celebrate their birthday in some small way. 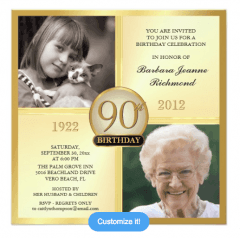 What an awesome way to celebrate a ninetieth! Many seniors don’t really want a birthday party, even for a milestone event like a 90th. What he or she might enjoy most is just spending time with you. It can be as simple as going out for a favorite meal, playing a game or putting together a jigsaw puzzle, or reminiscing over family photos. He or she might enjoy watching one of their favorite old movies or TV shows together, or attending church with you. A more active senior might enjoy fishing, a visit to a museum or park, or shopping. Remember that many seniors can be a bit lonely, and at 90, there’s a good chance that he or she is not able to get to as many of their favorite spots as they used to. Create a memory that you will both treasure by enjoying time with the birthday man or woman!